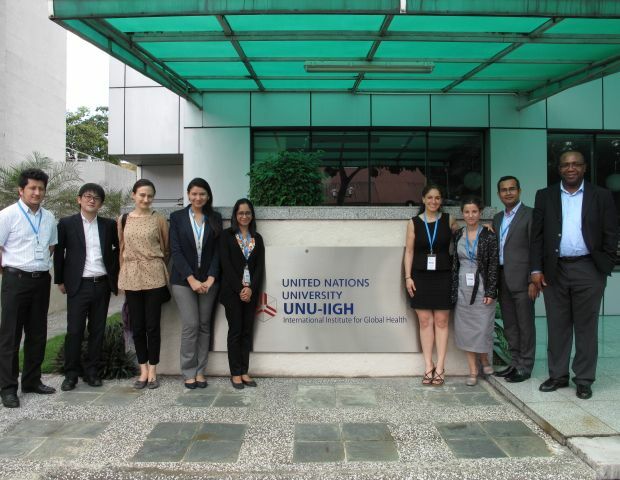 The 5th Meeting of the UNU Migration Network took place at the UNU International Institute on Global Health (UNU-IIGH) in Kuala Lumpur on January 12th 2015. The team at UNU-IIGH warmly welcomed the six focal points of the different Institutes that constitute the Network, which is co-ordinated by Dr. Valeria Bello of the UNU Institute on Globalization, Culture and Mobility (UNU-GCM). The meeting provided an opportunity to welcome a new member: the UNU Institute for the Advanced Study of Sustainability (UNU-IAS). During the meeting, participants discussed ongoing developments in the Network’s activities and forthcoming events, including an event to be held in Paris in May 2015 on Prejudice, Discrimination and Extremism and the 6th Meeting of the Migration Network which will take place in Barcelona in June 2015 to mark the Network’s two-year anniversary, alongside a symposium on migration. Other topics discussed included the launch of a new research project on climate-induced migration to be carried out by researchers of the Network; the organization of a section on International Migration and International Security within the 9th Pan-European Conference on International Relations “The Worlds of Violence” of the European International Studies Association (EISA), which will be held in Giardini Naxos, Catania, Italy, on 23th-26th September 2015; and a range of other opportunities for collaboration between the members of the Network in the forthcoming months, through lectures, seminars, focus groups and workshops on migration. Please check the website of the UNU Migration Network for updates!